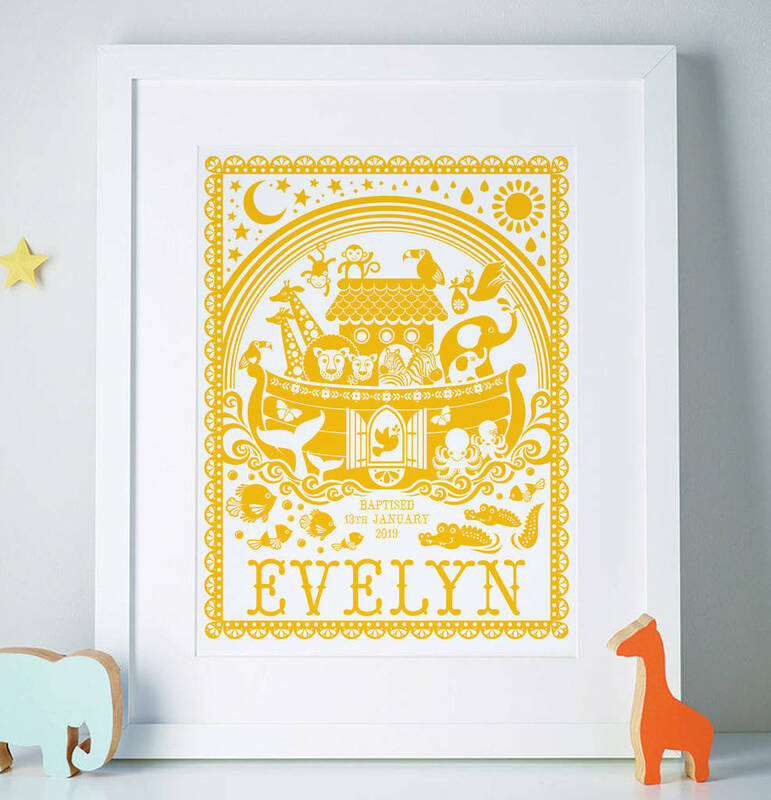 A beautiful, personalised Noah's ark print. This adorable Noah's ark print beautifully captures this much loved bible story. Children will love exploring all the different animal characters and will have fun spotting something different each time they look! This personalised illustration will be the perfect backdrop for any nursery or child's bedroom. Ideal as a gift for a new baby, Christening present or child's birthday, or as a special keepsake for you and your little one to treasure. 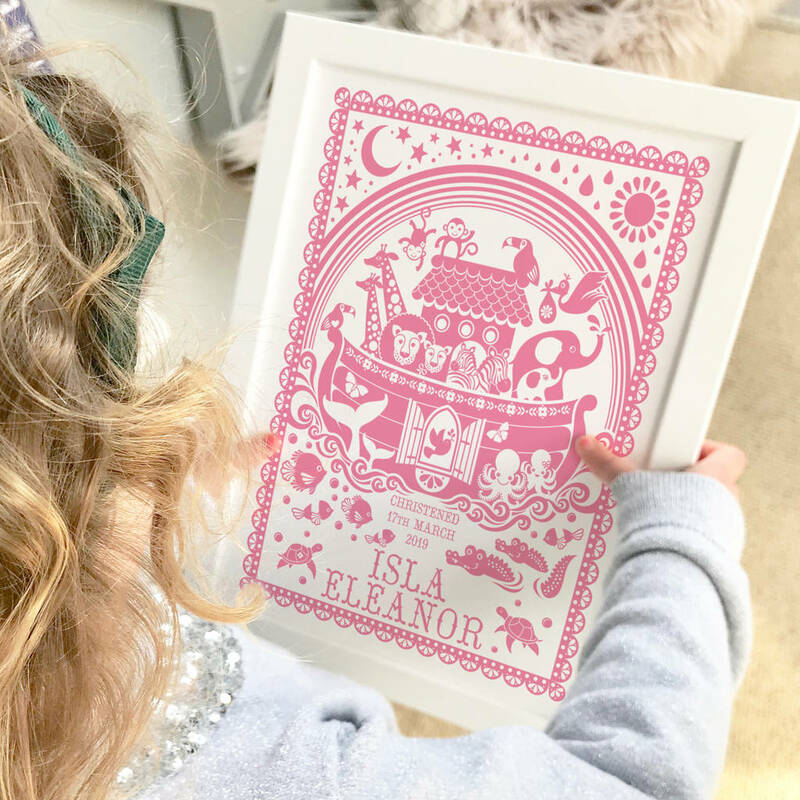 Your personalised Noah's ark print is custom made to order using your chosen name(s) and date, eg Noah, 25th March 2016. If you would like the word 'christened', 'baptised', 'named', 'dedicated', 'first birthday' or 'born' to appear above the date then please let us know by selecting your chosen word using the drop down menu. If you would like a different word to appear, please select 'bespoke' and let us know the details when making your order. Our prints are handmade and printed professionally on 310gsm fine art museum quality textured paper using the finest pigment inks. A4 prints are packaged in a cardboard envelope. 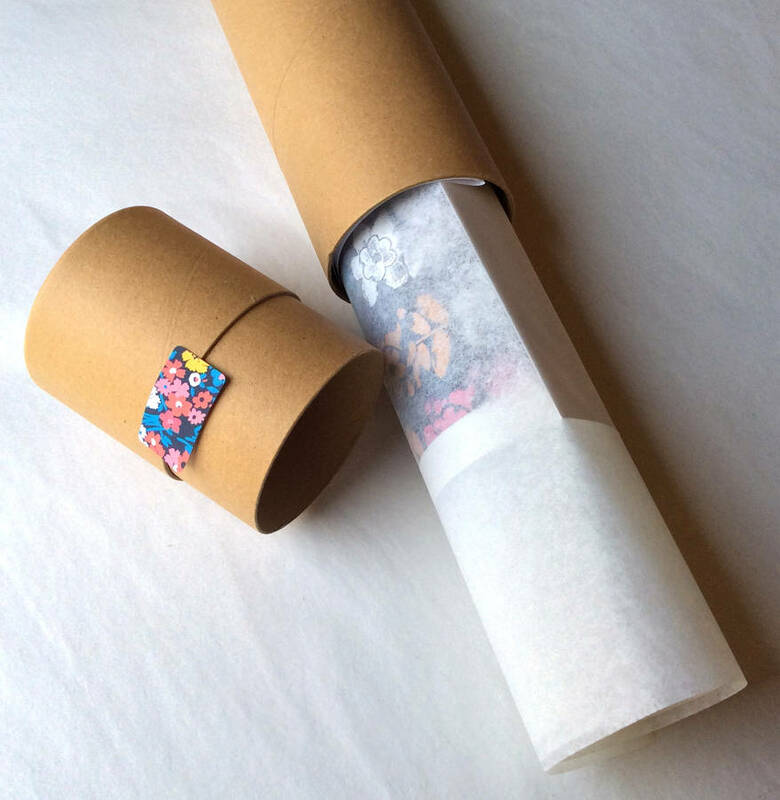 A3 and A2 prints are carefully wrapped in tissue paper and then sent in a sturdy cardboard tube. 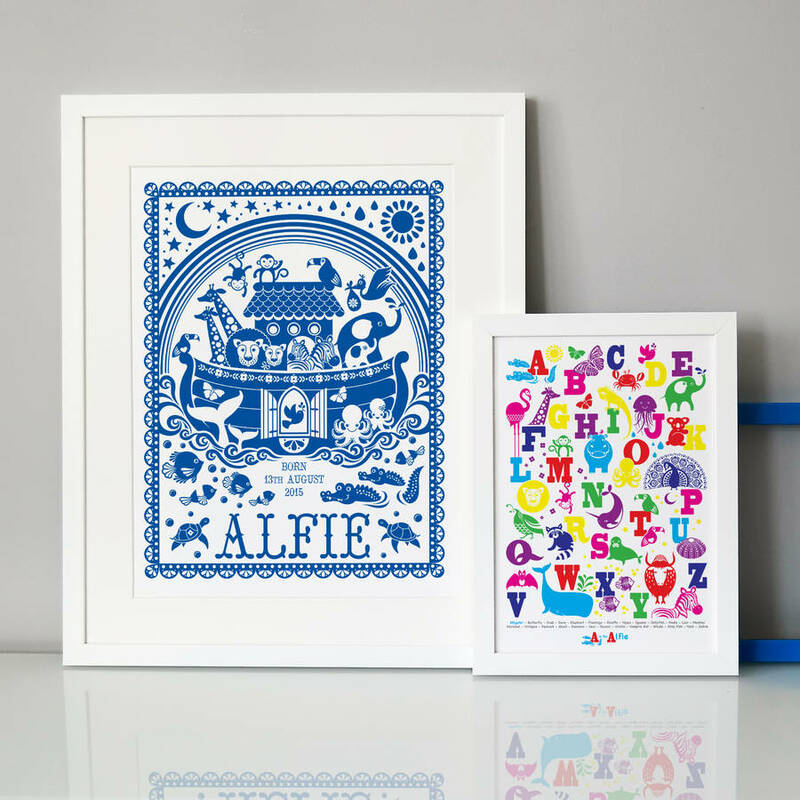 Both paper sizes will fit into standard 'off the shelf' frames. We are now offering a framed A4 sized Noah's Ark print which can be selected in the 'framing options' drop down menu. All of our frames are made from white painted solid wood, glass and include fixings ready to hang. 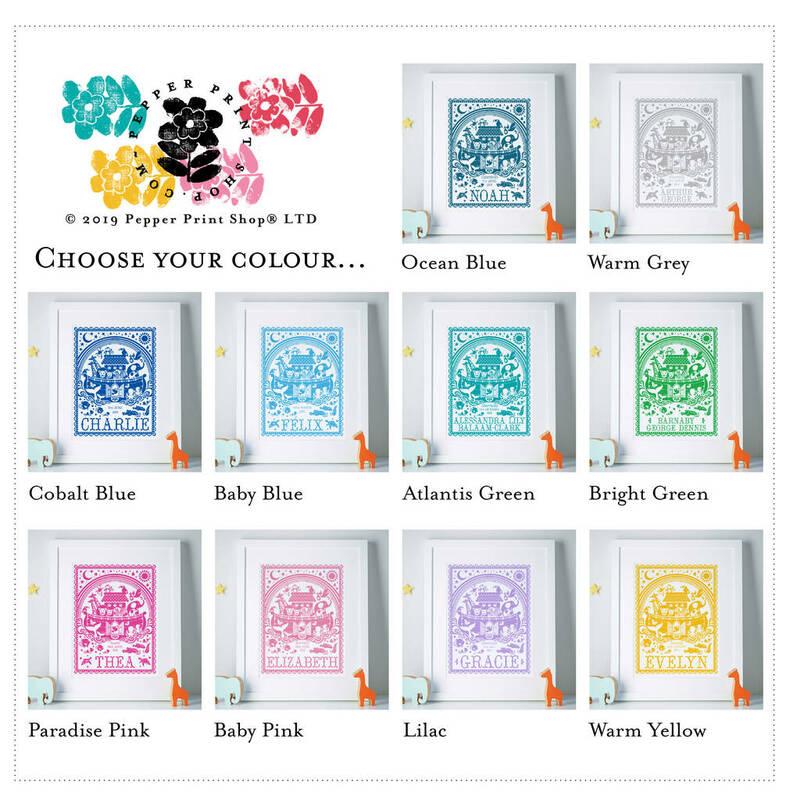 This product is dispatched to you by Pepper Print Shop.